Everyone needs to make a living, and there’s no nobler profession than that of the underrated bartender. 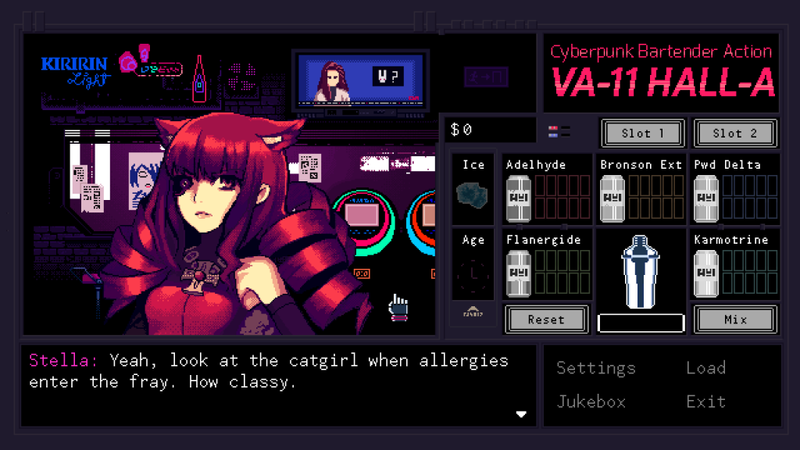 Made by developer Sukeban Games, VA-11 Hall-A is set in the year 207X, where technological modifications and nanomachines have run rampant. There seems to be one place in this cyberpunk, dystopian future where all walks of life are welcome. VA-11 Hall-A, or Valhalla, as it’s referred to by patrons and staff alike, is your average run down bar found on the side streets of Glitch City. Players take on the role of Jill, a sarcastic and smart young woman who’s just trying to get by. VA-11 Hall-A jumps right into the key mechanics of the game: bartending. This is simple enough with the trusty recipe book VA-11 Hall-A utilises. The B.T.C recipe book contains helpful instructions and ingredient specifications to create the right drink for each client. True to the profession’s form, players will have to listen to the patrons’ woes and confessions, along with taking drink requests. Jill assumes the ‘wise bartender role’ thoughtfully, without ever being rude or smug, especially when customers become prone to spouting inappropriate dialogue. The consequences for getting an order wrong elicits some pretty nasty criticisms, along with the loss of bonuses earned after each shift. VA-11 Hall-A requires serious concentration, as orders can become more complicated by the glass, and sometimes patrons will expect Jill to remember what they had ordered previously. With the money Jill earns after each shift, players will have to budget her funds responsibly, making sure there is enough for various expenses. Impulsively buying items that Jill wants will help her to concentrate and remember drink orders effectively. VA-11 Hall-A encompasses visual novel elements and presents a range of intriguing characters with different opinions, facts, and political bias. There is a lot of dialogue in this game, most of it is funny, strange, and also downright vulgar at times. As any game with a lot of text, the pace of VA-11 Hall-A can feel stagnated, but this is quickly remedied with the act of mixing drinks. The music of VA-11 Hall-A is the perfect soundscape for bartending, and also compliments the cyberpunk aesthetic of this game nicely. “Time to mix drinks and change lives” seems to be Jill’s mantra, as it is said before the start of every shift. Changing lives is indeed evident, as players can determine the outcome of specific characters, situations, and even the ending of the game. These are all seemingly achieved by what drinks the player makes and how the clientele responds to them. VA-11 Hall-A can often feel like a side story, pertaining to something bigger than itself. What players know of the outside world is only relayed by the patrons in the Valhalla bar. 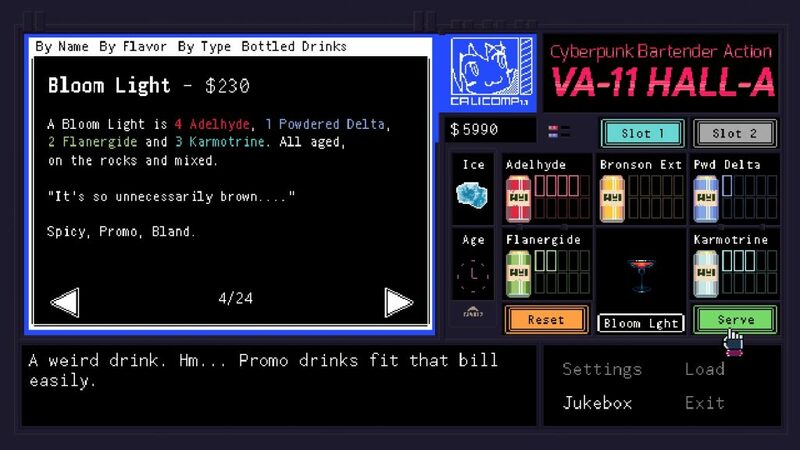 The bartending simulation aspect of VA-11 Hall-A is truly fun. There is something oddly pleasant in the act of virtually mixing drinks, especially when the right drink request has been met. The dialogue in VA-11 Hall-A is amusing and even thought-provoking at times. VA-11 Hall-A: Cyberpunk Bartender Action is a unique, quirky experience that’s definitely worth venturing into.